The English National Ballet recently completed a series of 14 sell-out shows at the new 500-seat Theatre at The Concourse Performing Arts Centre in Sydney, Australia, to celebrate the Queen’s Diamond Jubilee. In order to achieve a natural effect whereby the music did not sound over amplified, the venue’s sound designer and production engineer, Owen Ironside, selected a range of DPA microphones to capture the Willoughby Symphony Orchestra’s performance. On Ironside’s recommendation, the Concourse Arts Centre invested in 12 DPA 2011C Twin Diaphragm directional microphones, which were supplied by DPA’s Australian distributor Amber Technologies. 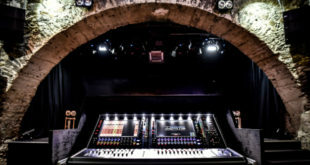 The combination of Ironside’s attention to detail and the performance of the microphones appeared to impress many, from the audience and performers to the musicians and venue staff. Following the English National Ballet performance, the Concourse Arts Centre has increased its stock of DPA microphones by investing in ten d:fine headset microphones, which it is using for musical theatre productions, and is also considering investing in different capsules for its Reference Series microphones to use during recording in its Concert Hall.